← We Got The Power! While hunting for her Leonard shirt, I came across what I consider to be one of the ugliest shirts in the world. She likes big oversized sweatshirts of places she has been. Technical Question: Does anyone know why my pictures look so awful when I upload them using Live Writer? I just tried loading the tarantuala shirt directly from WP and it’s SO much clearer. I haven’t done anything different to the pictures. I love the ease of uploading from LW but the quality has been driving me nuts. Any ideas? Anyone??? Aaaaahhhhhh!!! I LOVE the spider shirt! If I were a really mean mommy, I’d buy one for my son – who has a phobia about spiders in his clothes at the moment. Yeah. Hoping that one will pass soon…. This was one of the most colorful posts ever! Great shirts. But the spiders did make me shiver a little. What can I say? I’m a weenie. I’m a weenie, too. Don’t think I could live in the same house with the spider sweatshirt. EEEEKKKK!!! need to get a drink, a strong stiff drink, will be fine in a whicle, not really scared, good though! I liked the sport set as well.. very colourful! ok no way would you ever get me anywhere near that spider shirt. The spider shirt? Truly scary! EEEEEEKKK! OMGosh, I am very scared of spiders. That sweatshirt has a 3D effect to it. It’s almost as if the spiders were crawling all over it. My favorite it the George Town one and the DC one. We went there, but only for a day, I’d like to go back and see more. 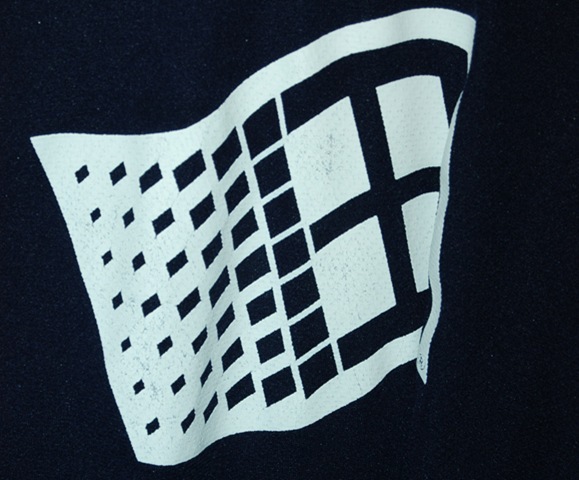 All those Windows shirts would be kicked out of our house as wannabes by our Mac. Are the spiders screen printed on, or? They look amazingly real. wow those spiders look real enough to me. I was going to write something fabulous…not really…til I saw those freakin spiders on steroids! Aaack!! Those freakin’ tarantula looking things have my skin crawling right now and I even let go of the computer mouse when I saw them, as if being connected to the screen via the mouse might make them reach me or something….ACK!!! EEK! The horror!! I can’t even look at those spiders without freaking out. How the heck can he WEAR THEM?!?? AHHHHHHHHHHHHHH!!!!!!!!!!!!!!! Now call me weird, but I just happen to love spiders. Cool shirt. I’d love to see peoples reactions to it when walking down the street. Eww. Spiders!! Yucky. I love how you went through each member of your fam to showcase personality type! The spiders look so much more real in the first picture. Yucky! I rather like the spider shirt too. I am not sure why there is a difference in uploading the pictures, but then I have not used Live Writer. I don’t WANT to see those spiders any clearer. Two nights ago I left my computer for a few minutes and turned around to see a spider come out from beneath my desk. His legs spanned the size of a half dollar. The hubby crunched him, BUT… he was even freaked. Obviously the quality and clarity is effected by the program that hosts the picture…. but the “why” would be in some programmers head. LOL! Love the spider shirt!!! Sorry I can’t help on the Live Writer thing, I’ve never used it. Have you tried the forums? The spider shirt creeps me out and its only a picture! Sheesh! 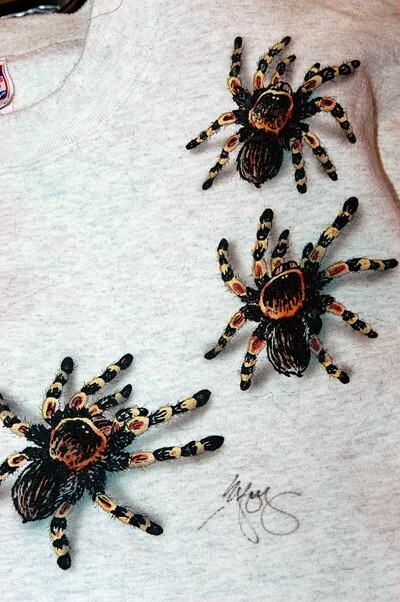 I soooo don’t want to mention the spider shirt because EVERYONE else has, but daggum it…I LOVE IT!! And I HATE spiders (go figure). Obviously, it strikes a chord in all of us. Yours is the first post I’ve seen that has a shirt I own, too–the DC pink sweatshirt (mine is navy). Yikes! Does anyone ever try to knock the spiders off?! yucky…that spider gave me chills for a second…but is is fantastic cause it does look to real! Oh wow! Those spiders look so real! No wonder he gets a reaction out of people. Okay, I shrieked a little bit after seeing that tarantula shirt. Spiders give me the heebie-jeebies. Eeeek!! The spider shirt gives me the willies!! I love the spider shirt. And I have the same problem loading photos with LW. If anyone has any ideas, I want to read them too! I love the tarantula one!! Do you get a free Microsoft shirt when you move to Washington? Because I love free shirts, even if they have a ubiquitous company logo on them! that spider shirt would freak me out!!! oh. my. goodness. those spiders are scary!